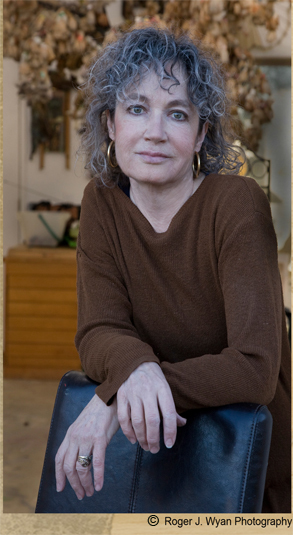 Karen LeCocq is an accomplished artist, author and art teacher with roots and tradition in feminism and Zen philosophy. She lives in the Sierra Nevada mountains and has a lovely commute down to UC Merced, where she’s been teaching art since the campus opened in 2005. Ms. LeCocq was recently elected President of UC-AFT Local 6366. 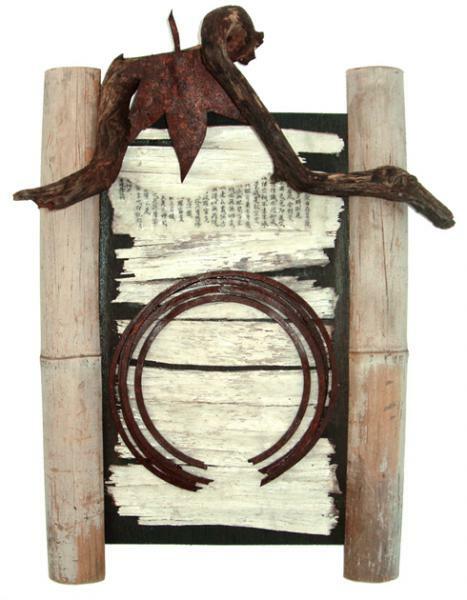 LeCocq’s assemblage sculptures transform pre-existing, natural or manufactured materials, discarded objects and bits of junk, into beautiful works of art. One recent piece of work repurposed an obsolete sign from the UC Merced campus. 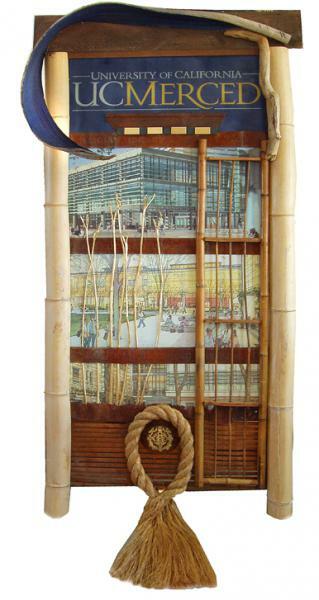 Her work has been shown nationally and internationally in galleries as well as major museums. LeCocq was part of the groundbreaking feminist art class taught by Judy Chicago in 1970 at CSU, Fresno, and she continued with Chicago and Miriam Schapiro at the California Institute of the Arts, taking part in the internationally acclaimed project, Womanhouse (1972). Insider: What do you love about teaching painting and sculpture? LeCocq: I love seeing what the students come up with for their projects. UC Merced has no art major, so the majority of my students are not planning on being artists for their main occupation. They usually start one of my classes having little or no art experience, perhaps a class in high school, yet most are open to trying new things and really want to create a “good product”. I am surprised how fast they learn and how open they can be to suggestion. I love it when they tell me they are going to continue doing some kind of art after they leave my class. At this mostly left-brained school, they need some right-brained activity for balance. Insider: What do you feel is the most important thing for you to teach your students about being an artist? LeCocq: There is no “one way” to do art, and all the creativity you ever need is inside you. I tell my students in each of my classes that I am not going to show them the one way they have to do something, that there is no magic formula to making good art. I tell them I will show them many ways to manipulate the materials, but I want them to come up with whatever “it” is in their heads. I ask what they want their work to represent and I try to give them suggestion on how to make that happen. Insider: In addition to being an accomplished artist, you're also an author. Is there some nexus between your art and your writing in terms of process or in one type of work informing the other? Insider: Your first book was an autobiography covering your early days as at artist, your activism within the feminist movement and your struggles with mental health issues. Due to the recent violence in Isla Vista, much of the current issue of the UC-AFT Insider was devoted to issues around mental health and how we relate to and work with our students. What insights do you have about working with students who might be struggling with mental health issues? LeCocq: My website, karenlecocq.com, has the titles of my books on it and anyone can see them. Many of my students have seen the title of my autobiography, The Easiest Thing To Remember: My Life As An Artist, A Feminist And A Manic Depressive, and have asked me about it. Some have read it. I am very open about my mental health issues and I have encouraged others, students included, to be as open as they can as well. It is the only way to rid us and our society of the stigma associated with mental health. The more open our society can be, the less afraid people will be to seek help and the more tragedies can be avoided. I hope that someday soon, going to your counselor, psychotherapist or psychiatrist for problems of the mind will be as common as going to your doctor for physical illness. There should be no shame or repercussions involved. Insider: You were recently elected president of the UC-AFT local at Merced. What are you hoping your local can accomplish over the next year? LeCocq: My main goal right now is to increase enrollment and participation in the union. There are many lecturers here at UC Merced who are not members. I think some of the reasons may be not wanting to get involved in anything that they are not paid to do, that lecturers are already overworked and have little time for anything more, and the fear they might be labeled a “dissident” or “troublemaker” and then not get offered a contract for the next semester. I would like to help dissuade those and other concerns which my fellow lecturers may have about joining the union. Insider: You'll be attending the CFT Union Summer School this summer to get some training on running a union local. What are you hoping to learn? LeCocq: I hope to learn how to be an effective president and how to get 100% of the lecturers at UC Merced to be involved union members helping to fighting the good fight for us all. Insider: UC Merced is a new campus. Do you think this presents unique challenges or opportunities for lecturers there? LeCocq: One of the challenges is that we are a small university compared to the other UC campuses. However, that can be an advantage as well because we can get to know everyone. I would like the lecturers to be more of a “presence” on campus, so I do things like encourage my colleagues to go to commencement. Some lecturers feel they are not wanted at the ceremony and it is only for senate faculty. I feel we are just as important in the lives of our students as the senate faculty. They usually see us more, take more of their classes from us, and feel they can talk to us. On a small campus like Merced, we're visible at commencement and our students like seeing us there at such an important moment in their lives. I have gone to every commencement since UC Merced began and I see the reaction in my students. I was a name reader at the commencement this May. I heard several students say to the person who was handing me the name cards that they wanted me to read their name. We are an integral part of their educational experience and they appreciate us being there for them. We do make an impression in their young lives. Insider: Building our "presence" on campus is right at the heart of our You See (UC) Democracy? campaign. Increasing lecturer participation in commencement ceremonies is a really good example of an enfranchisement issue for lecturers. How might the UC-AFT Local at Merced begin to organize around issue like this? LeCocq: This is exactly what I hope to learn at union summer school. I’d like all lecturers to feel they are a real part of the campus and be given the same rights and respect of senate faculty. An example of this is that lecturers in my department are not asked to attend faculty meetings, much less given a voice or a vote on important issues. This needs to change. I recently took a stance on a small but important issue. I was tired of getting e-mails addressed to “Faculty, staff and lecturers”. I stood up at a meeting and asked, “Aren’t we ‘faculty’? Why are we being separated out as something other than faculty?” The response given was stumbling and inadequate but I haven't received another e-mail addressed in that manner. When we have more actively involved members taking action like this around campus, I believe we can begin to change the culture. Strength in numbers really means something here. Insider: Can you tell us about Neko? He seems to have played an important role in your Zen philosophy or practice? LeCocq: Neko was my beloved cat. I created the adult picture book, Are You In The Meow? Allowing Your Cat To Guide You To Enlightenment, because in observing him (and my other cats as well), I saw that animals can teach humans a lot about being in the present time. Actually, I have Neko listed as the author; I am just the translator (from cat-speak) and illustrator of the book. It is written from the cat’s point of view. 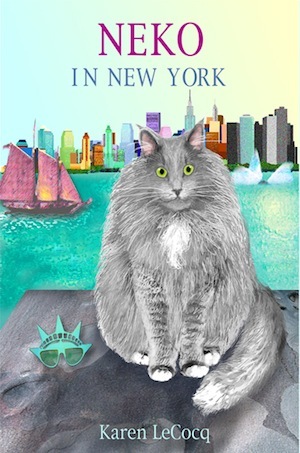 I also created a children’s book, Neko In New York about a cat who takes an accidental trip to NYC and finds his way back home. Neko died a few years ago. I still miss him, but he lives on in the books for me.